Mom wanted me to take my selfies yesterday but I was a little miffed at her. Can you tell? She was making me wear the harness again — all day! Well, it seemed like all day. I did not want to look at the camera or push that stupid little button. Finally, I begrudgingly gave in. I decided that she does do some nice things for me and I hadn’t had dinner yet. 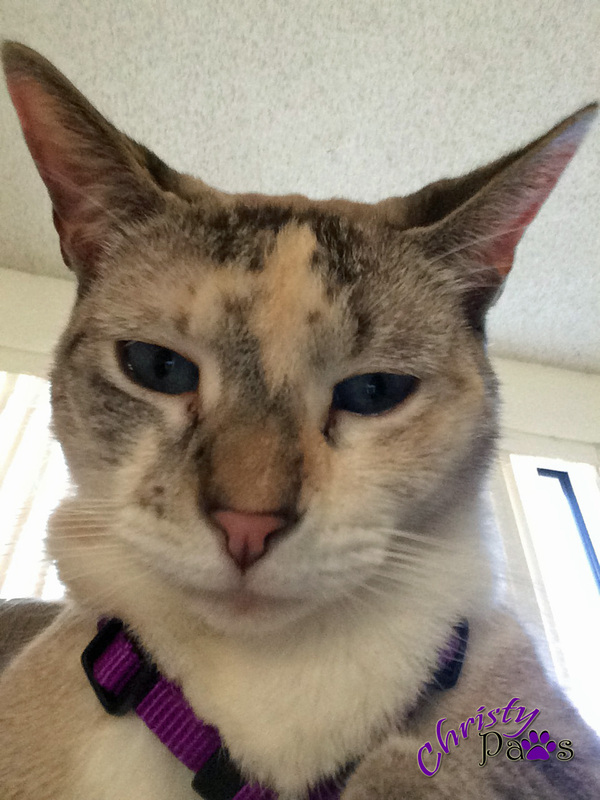 Tagged cat, cat photos, funny cat photos, harness, Sunday selfies blog hop. Bookmark the permalink. You do look annoyed…but beautiful. Your harness is cute, but we can definitely tell you were not pleased there. We hope you got a tasty dinner in compensation. Oh Christy that is a fantastic selfie… Amelia will have to work on her annoyed look so she can get one that good someday! Such cute selfies of you! Well we think those are all terrific!!!! You do look peeved MOL!!! You took some MAHVELOUS selfies!!! Very nice – up close and purrrrrsonal! Well, all things considered, that’s a pretty good selfie! Bwwwwah!!!!!! That is my favorite of the day so far!!!!! Catabulous! Christy a kitteh must doez what a kitteh must doez…speshelly iffin dere iz food innvlved! Yer so purrty eben when annoyed…. When all else fails… give her the ears. I’d be miffed too if my human made me wear my harness all day. I only wear it when I go outside. Why is she tormenting you? I don’t walk on a leash yet and she is trying to get me used to it. I still walk all funny when I have it on! Aaaaw Christy yous look bootyful and yous hawness is gawjus on yous. It’s da purrfect color. Christy, we think that selfie is terrific even if you were miffed. You are doing a lot better than us. We will not allow the camera that close to our faces. Mes not surprised yous miffed! Mes hates harnesses too! Mes much prefers to goes outside on a leash and collar. This harnesses chafes! But you selfies does show how drop dead gorgeous yous is!